Fox News has obtained new documents from a government agency which contain detailed proposals for presidential action that could lead to legalization for undocumented immigrants. Mike Emanuel reported this evening that sources say President Barack Obama was briefed on the plan before his Asia trip. Executive action could be announced as early as next week. As part of the 10-point plan, up to 4.5 million illegal immigrants living with their American born kids would be allowed to stay in the U.S., an expansion of deferred action. The plan would also expand deferred action for DACA children. There is also a proposal to raise pay for ICE officers to boost morale. The plan would also allow family members of illegal immigrants another avenue for citizenship through the military’s delayed entry program. Sources say this avenue will likely be exploited, with people joining the military, then not showing up for boot camp. Other proposals include a 50-percent discount to the first 10,000 naturalization applicants, 500,000 technology jobs through the State Department visa program, and increased border security. Then, Charles Krauthammer weighed in on the plan, blasting it as "constitutionally odious." He said the proposal is an advertisement to the world that you can come into America illegally, and if you wait long enough, we will legalize you. Sen. Jeff Sessions (R-Ala.) was on “The Kelly File” tonight, where he slammed the Obama administration’s immigration plans, which were reported earlier this evening on Fox News. 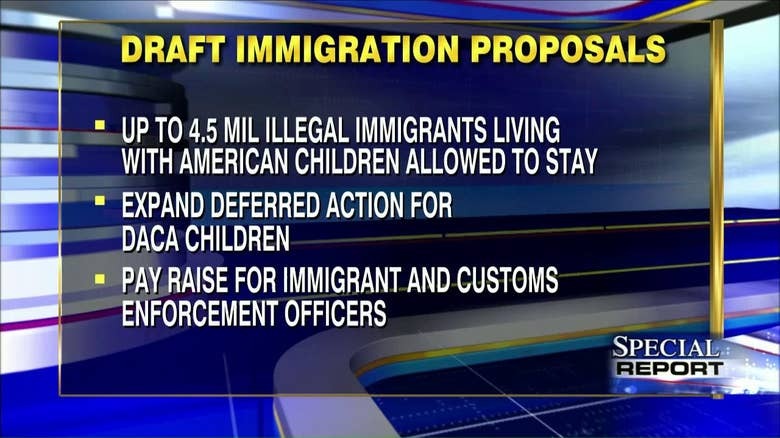 As part of the 10-point plan, up to 4.5 million illegal immigrants living with their American born kids would be allowed to stay in the U.S., an expansion of deferred action. Sessions said that immigration officers have said that if these plans goes through, it will be “almost impossible” to enforce the law. He added that "executive amnesty" is really "a threat to constitutional order."